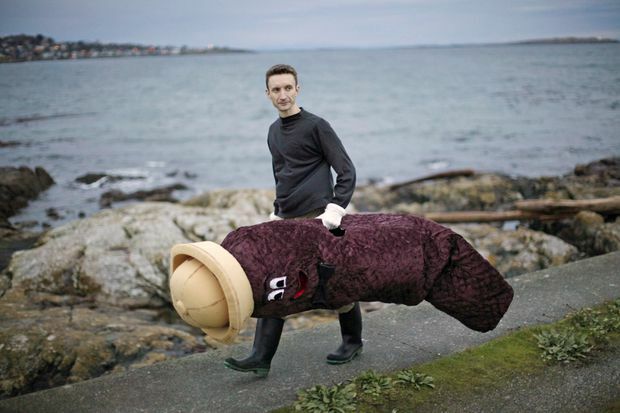 Local sewage activist James Skwarok, also known as Mr. Floatie, walks along the seawall near Clover Point in Victoria, B.C., on Nov. 22, 2012. Sarah Wolfe is an associate professor and associate director of the undergraduate studies School of Environment, Resources and Sustainability (SERS) at the University of Waterloo. Psychologists may understand how disgust works, but little of that science has made its way into other fields or our public policy. In the field in which I work – research on the interactions between people, society and water – the role of emotions generally, and of disgust specifically, is largely ignored. Yet, increasingly extreme water conditions are affecting our societies and our water policies, and consumption behaviours are out of step with those conditions. All of us – researchers, policy-makers, corporate leaders and members of the public – should begin to recognize how the presence, intensity and even absence of disgust can critically influence our water decisions – sometimes for better, but too often for worse. How we react to drinking water is one example. Disgust and drinking water are linked by what psychologists call perceptions of “contagion.” Some people believe that when water has been touched by an undesirable substance – for example, feces – it will remain disgustingly tainted until somehow cleaned or purified. Bottled-water companies successfully exploit such perceptions by emphasizing how their products are separate from and free of contaminants – and so safe, pure and beneficial to health – despite the fact that their water is often inferior to what comes out of the municipal tap. Sometimes this kind of disgust reaction undermines good public policy. The collection, cleaning and reintroduction of “dirty” water – including sewage – into water systems is a well-proven method to safely maximize drinking-water availability in water-scarce areas. Windhoek, the capital of Namibia, was one of the first cities to develop and implement a “toilet-to-tap” system on a large scale, more than 50 years ago. Now, cities around the world are seeing their wastewater as a supplement to constrained water supply; philanthropists are supporting innovations in this kind of waste and water management. But people are often appalled by the idea that their drinking water might have once touched feces, even if it has been cleaned to the highest standards and represents no harm to human health. The rejection of recycled water shows how disgust can derail thoughtful water management backed by good science and implemented through innovative infrastructure. Yet, disgust can be a powerful force for positive change, too. In Victoria, disgust associated with feces helped catalyze support for the city’s first wastewater-treatment plant. The now-retired life-sized mascot, Mr. Floatie represented the human poop Victoria dumped directly into the ocean for decades. He was a magnificent prop for candid photographs, snarky tweets, punchy headlines and political jokes. But Mr. Floatie also stood for the undeniable, uncomfortable truth that we’re defecating animals. He was an especially potent symbol because he operated simultaneously at three psychological levels by reminding us of our messy “creatureliness,” our vulnerability to disease (from, for example, contaminated water) and our ultimate and unavoidable mortality. What’s particularly tricky, though, is that not all contaminants in our drinking water generate disgust, including some that probably should. Things such as feces, dead animals or human corpses reliably produce disgust that can motivate or change human behaviour, social norms and sometimes even public policy. But invisible contaminants – including synthetic hormones, residual medications and the microplastics accumulating in the food chain and within us – don’t seem to trigger or sustain such visceral defenses. We may fear these contaminants and take some action, but our lack of disgust limits technical, political and social momentum to solve these problems. Human emotions are complicated, so talking about them is never easy. But given the many and multiplying stresses on our drinking-water systems, it’s time to stop ignoring how powerful and universal emotions such as disgust both help and hinder our water decisions. Sure, it tastes good, but what are thieves going to with 30,000 litres of stolen Newfoundland iceberg water?